“I am not what happened to me, I am what I choose to become” Charles Jueng. As you understand this game we call life, you realize that there are certain principles that if followed, will improve your life experience. Why not apply them? Existence is bigger than anything you can wrap your brain around. Most people have something that they think defines them. “I’m an accountant.” “I’m a golfer.” “I’m the father of two boys.” What we often fail to see is that we are so much more than all of those things. These are all external factors. What happens when the accountant losses his job or a shoulder injury puts an end to the golf game? Posted by Joel Brookman in Adjust Your Sails, Direct Your Life. In my book, Adjust Your Sails, I spend time discussing the fact that the happiness you experience in life has a lot to do with your ability to go with the flow. If you are constantly fighting the flow and trying to change things instead of accepting what is and navigating from there, you will always be struggling. That struggle will manifest as frustration and eventually lead to unhappiness. My coach is a woman named Joan King. Joan was diagnosed with breast cancer and took the diagnosis as motivation to teach others. After months of radiation and chemotherapy, she came out more determined than ever. A year after being cancer free, she was told that it had metastasized into her liver. While many of us would have considered this diagnosis a death sentence, she knew better. Posted by Joel Brookman in Adjust Your Sails, Self improvement, time management, Uncategorized. Posted by Joel Brookman in Adjust Your Sails, Exceed Expectations, Go beyond what anyone expects. 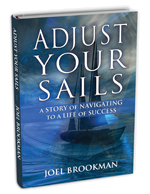 Posted by Joel Brookman in Adjust Your Sails, Direct Your Life, Plan your life, Uncategorized. In chapter four of Adjust Your Sails we take an in depth look at the concept of how to create a bucket list. The primary focus is on fulfillment. The reality is that none of us know when we will spend our last day on earth. No one ever sat on their deathbed and wished they had spent more time working or taking care of the house. The real question is, what are those things you want to do while you are here? Have you taken the time to create a list? If not, what are you waiting for? Posted by Joel Brookman in Adjust Your Sails, Direct Your Life, Plan your life, Take Control of Your Life.